MIPAQ has replaced the ME450FI (3mm seal) impulse sealer with the new improved ME455FI, which boasts a solid 5mm seal and a much larger transformer capable of more heavy duty applications. 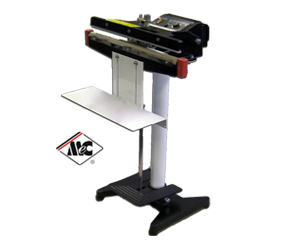 This new model is perfect for PE, PP, Foil, BOPP, PVC and many more types of plastic up to thicknesses in excess of 250 micron. As always MIPAQ stocks the full range of spares and consumables for all MEC machines, including elements, Teflon, control timers, transformers, silicon rubbers and lots more, to ensure that both your older ME450FI and your NEW ME455FI MEC heat sealer stays operational.